If there is one aspect that Forex traders are less aware of is the price they pay for the Roll or as some brokers call it Swap and I figures I’d take the opportunity try and explain what it means and how much you are paying for it. So the Swap or the Roll or the Rollover or the Interest is the actual interest you pay for borrowing money from a different country that has a different interest rates than the original country, so for example if you open a Long 100K position on the EUR/USD what you do in reality is borrowing Euros for value of $100K and holding it until you sell (Close) the position. So when trading the EUR/USD there is a difference between the interest in Europe and the Interest in the US and since you borrowed the money from Europe you have to either pay or receive the gap in interests that a $100K will accumulate over the holding period. So far it seems clear, or as clear as it can be, the problem starts when the brokers take it upon themselves to actually set the interest they want to set and keep this as quietly as they can so traders wouldn’t know about it. Here are a couple of examples that I found in the market – this is not intended to put these brokers on the spot but to bring these examples to your attention. 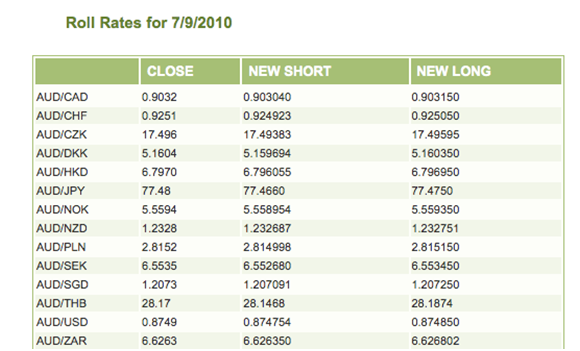 1) Alpari (And others) Charges you money on the EUR/USD if you have either a Long or Short position – Seems fair? Well – it’s not – there are a few brokers that to charge all their traders money regardless of the position they hold – So imagine the volume of Long and Sort Positions the broker has and never even clears with the banks – all this is volume generates a risk free income on a daily basis because all traders pay and none are getting paid. 2) For some brokers you have to beg to get the rollover data, I spend 20 minutes on the phone with a person in eToro and got nothing – let me know if you can get anything out of them regarding their Interest rates. 3) Some brokers “adjust the prices” instead of charging the roll – I spent half an hour on chat with support of GFT and at the end all he could give me is an indication that change the price and give you a new price at 3PM instead of charging the rollover – Seriously people!! What this means in real life is that every day at 3PM they decide what is the new price and take any amount of money they want from the traders. The following is a scarce screenshot of the data from GFT – again it takes forever to get access to this data. 4) You would not believe what is the difference of rollover between different brokers – as an example I took the AUD/CAD, for one broker the charge for Short position is $10.41 for one standard lot and you are paid $8.02 for a Long position. The same pair on a different broker you pay $13.8 for Long and get paid $6.3 for short meaning that at the more expensive broker you are pay 32% more and are paid 21% less. The reason this was interesting for me to explore was after talking to some folks from the NFA and understanding that the main reason to ban hedging in the US is the fact that the brokers are unclear about their interest charges and if a trader has opposing positions and he thinks that he is neutral he is actually not neutral and is losing money every day that goes by. As far as I know, Roll is the actual interest you pay for borrowing money OVERNIGHT, correct? If you’re in and out of a trade in the same day, there is no roll.